His legislative base voted out, will ‘street-fighter’ LePage adjust? In recent weeks, Gov. LePage has appeared, at times, like a man without a country. Now, he's a man without a Legislature. In the weeks before Tuesday’s election, Gov. 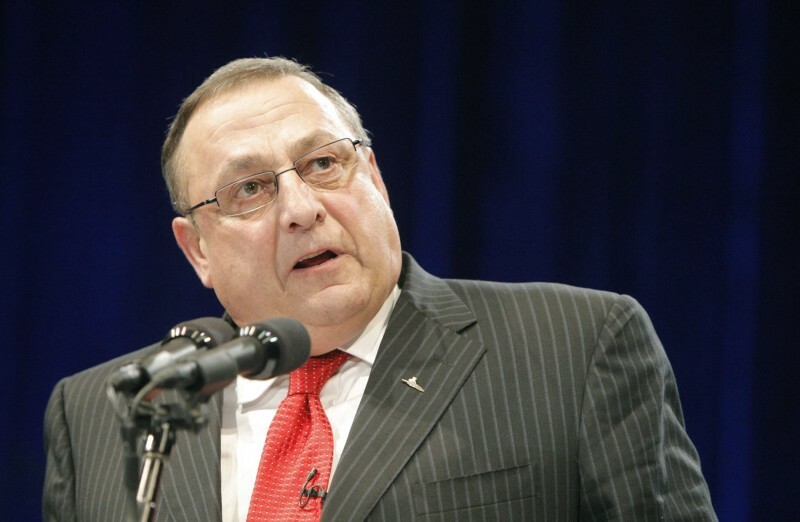 Paul LePage’s public appearances were limited to food drives and ribbon cuttings. The governor was not summoned to the campaign trail to defend his policy agenda or the Republican legislators who helped enact it. LePage’s volcanic broadsides against Democrats have been confined to scripted YouTube videos, a rhetoric delivery system ill-suited to a governor accustomed to letting it fly. He has appeared, at times, like a man without a country. LePage is now a man without a Legislature. Democrats on Tuesday swept away the current Republican majority in a decisive victory that was dangerously close to giving Democrats the numbers to override even the threat of a veto. On Wednesday night, Democrats unofficially held a 21-13-1 majority in the state Senate, with potential recounts in two races, and an 87-60-4 majority in the House (potential recounts in six races). The Democratic majority is also likely to remove and replace the state’s constitutional officers. Three of them — Treasurer Bruce Poliquin, Secretary of State Charlie Summers and Attorney General William Schneider — have been some of LePage’s closest allies, despite serving in a different branch of government. LePage’s aversion to state borrowing will not be reinforced by Poliquin’s frequent proselytizing. A Democratic attorney general will not be so willing to enable the governor’s battle with the federal government over still unauthorized cuts to the state’s Medicaid program. Additionally, any hyper-partisan policies LePage had hoped to advance are effectively dead. His vision of enacting a divisive right-to-work law to subvert organized labor will go nowhere. Also in trouble are LePage’s plans for additional cuts to publicly funded health care for low-income Mainers. There may be hope for his energy policy, but not at the expense of the state’s wind industry lobby, which LePage has repeatedly blasted as a special interest group bankrolled by taxpayers. In short, the governor will achieve very little without the help of a new Democratic majority. Can the two sides work together? The governor’s spokeswoman, Adrienne Bennett, later added that the governor is ready and willing to work with Democrats. Bennett argued that LePage has done so before, when he was mayor of Waterville and worked with a largely Democratic city council. The Waterville City Council, of course, differs from the Legislature, home to 186 lawmakers with varying degrees of political ambition. The governor is also slated to seek a second term. It’s unclear whether his re-election chances are better if he forges consensus with Democrats or uses legislative gridlock and policy difference as a foil. Publicly, Democrats are withholding prognostications. Others aren’t so sure consensus building is in LePage’s DNA. After all, some argue, LePage’s successful run for governor was laden with verbal salvos against what he later called “the loyal opposition.” He once called Sen. Justin Alfond, D-Portland, a “little spoiled brat.” Alfond is a rumored candidate to become the Senate president for the 126th Legislature. Michael Cuzzi, a former Democratic campaign strategist who manages the Portland branch of VOX Global, a Washington, D.C.-based consulting firm, believes it’s unlikely that LePage will be able to shelve his “street fighter” approach to governing. The governor has been just as combative with Republicans who questioned or balked at his policy initiatives. He blasted Republicans for not moving quickly enough to pass his budget. Last year, he vowed to campaign — code word for “primary” — against opponents who did not have the “political courage” to pass his controversial Medicaid and energy policy reforms. Ultimately, LePage didn’t have to campaign against Republican lawmakers. His legislative allies fell amid a Democratic resurgence and a Republican campaign that left its biggest booster on the sidelines.